ALBUQUERQUE, N.M. — Halloween doesn’t uncloak itself until the end of the month, but the whole of October feels full of the holiday spirit. 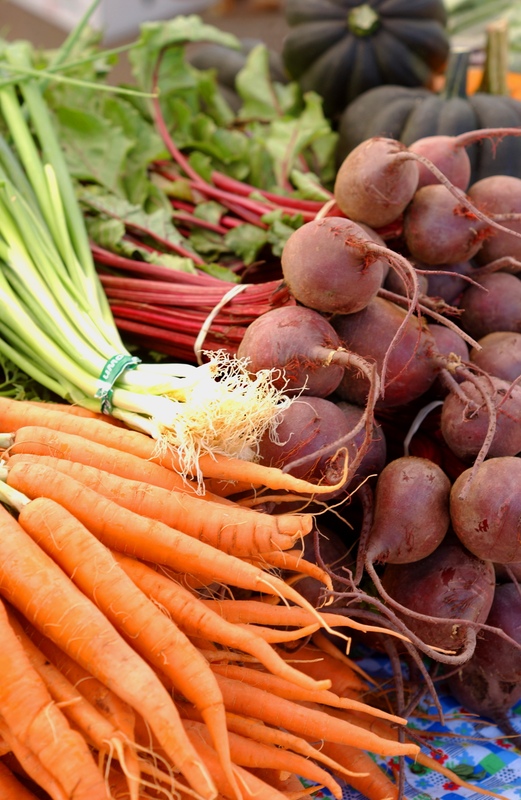 Carrots and beets only start the list of sweet vegetables that overflow growers’ markets in the fall. Whether it’s childhood memories or the hyper-marketing that fills grocery aisles with excess candy for months, it’s hard to avoid thinking about sweetness in October. Baking with vegetables is nothing new. Many sneaky parents whip purées into a variety of dishes. But even without kids in the house, you might want to try turning some of October’s locally grown vegetables into a sweet treat. Sometimes there’s very little you need to do in your role as food magician: roasted carrots or winter squash with a touch of butter and brown sugar or honey are always easy to pull out of the oven. Sometimes the vegetable transformation takes a little more work, but the payoff can be worth it. If you don’t bake often, be sure you bring the ingredient list along to the store with you. Whatever your cooking approach, starting with the freshest produce flavored by New Mexico’s unique growing conditions gives you the best launch pad for serving up sweet vegetables. And, as the weather cools, frost helps some vegetables like broccoli, cauliflower, cabbage, spinach, chard and kale produce sugars, and other vegetables like parsnips, carrots and celery root convert their starches into sugars. Natural sugar not only tastes good, but it helps plant cells resist frost damage. Most growers’ markets and farm stands around the state close for the season at the end of October (or whenever the first hard frost hits), so be sure you get there soon to make the most of your October farm shopping. BEETS: Not all beets are created equal. They share an earthy flavor, but try chioggia, an Italian heirloom with striped red and white interior and a sweet, mild taste, or golden beets with lovely yellow color and mild taste. CARROTS: Fresh greens atop the carrots tell you just how fresh that bunch is. Look for gorgeous rainbow carrots in orange, purple, yellow and white. More colors mean different micronutrients in the various pigments. HEARTY GREENS (kale, spinach, Swiss chard): Cooking greens can be a great comfort food. Warm creamed spinach, Swiss chard in your eggs or stir fry, or a green smoothie for breakfast are always good choices. PARSNIPS: Great in soups and stews, these root vegetables that look like big, fat white carrots have a sweet, nutty depth of flavor worth incorporating into your meals as often as you can. WINTER SQUASH: Pumpkins get all the glory at Halloween but there are many flavorful, nutrient-packed varieties to choose from. Butternut and acorn squash are widely available, but at grower’s markets, be sure to try lesser-known varieties such as red kuri or kabocha. Red kuri is small, round type of hubbard squash with yellow flesh and a chestnut-like flavor, and kabocha is a small, round Japanese variety that is red or green with light white stripes on the outside with a nutty earthy flavor. While you’re thinking about sweets, don’t forget about local honey. Stocking up now for winter is always a great idea. Let there be vegetable magic this Halloween season! Denise Miller is executive director of the New Mexico Farmers’ Marketing Association. Visit FarmersMarketsNM.org and DoubleUpNM.org. 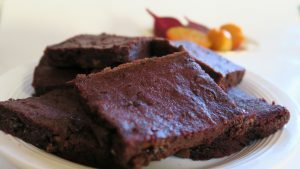 Beets make these brownies a moist mash-up of sweet and savory. Use any color beets, but red give the batter that red velvet sheen. Coffee is optional but brings out the taste of the chocolate. Start by baking the beets, even the day before. My favorite way is to chop off the top and bottom of each beet, rub them with olive oil, and then wrap them in foil. Bake at 350 F for 45-60 minutes or more if necessary. A fork should slide very easily through the beets when done. The skins will slip off easily. Purée in a food processor or with an immersion blender. Three small to medium beets should yield around 1 cup puréed beets. Preheat oven to 350F. Grease an 8-by-8-inch pan. Set aside. Combine butter and sugar. Add eggs, vanilla, coffee and beets. Whisk dry ingredients. Add flour and cocoa powder. Fold in beet mixture, and add chocolate chips. Pour into prepared pan. Bake 30 minutes or until toothpick in center comes out clean. Cool completely before cutting. 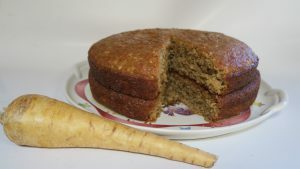 Versatile parsnips, paired with spices and hearty almond flour, create a cake that could become a winter staple. Combine dry ingredients. Whisk for one full minute to aerate flours. Combine wet ingredients. Whisk to dissolve sugar. Combine wet and dry ingredients. Fold in parsnips. Pour into prepared cake pan. Bake until center springs back or a toothpick inserted near center comes out clean, about 35 to 40 minutes. While cake is baking, prepare glaze: Melt butter and maple syrup over low heat. Heat until the maple syrup starts to boil and the butter is melted or close to it. Allow to cool for several minutes (so the buttermilk doesn’t curdle), then whisk in the buttermilk. Flip cake out onto a large plate, and immediately pour the glaze over the hot cake, taking care to distribute evenly. Optional: Poke holes with a chopstick or toothpick so the glaze will seep in better.